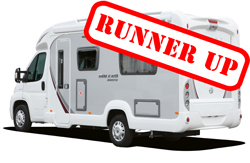 The Caravan Industry Awards were presented in October at NEC, during the International Caravan & Motorhome show 2009. One of the categories judged is the Thetford Washroom of the Year Award, sponsored by Thetford, and is for the washrooms in motorhomes considered by the judges to have the best and most practical design and fittings. Exhibitors may only nominate one entry each and there is a winner and a runner-up. 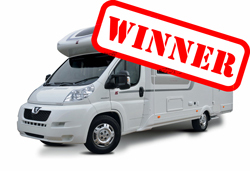 Dave and Liz King took a look at both motorhomes to see if they agreed with the judges! The end washroom in the pre-production prototype Auto-Sleepers Cotswold EB has a modern, yet luxurious look to it with “Amarti” coloured cupboards, well it’s walnut to you and me. The rectangular shower cubicle is tiled in dramatic black fibre glass tiles and has a two piece clear acrylic shower door. There was a chrome rack for soap and other accessories. The round acrylic basin has a black tiled splash back and there’s certainly space each side for toiletries and more space in the cupboards underneath. We were in awe of the blue LED lights around the mirror over the washbasin. Wardrobe space was good, and there were three drawers too. The domestic style door has a towel ring on the back of it and the Thetford cassette toilet was craftily hidden and is unseen when the door is open. We really liked the eye level cupboard over the toilet. The Swift Bolero built on a Fiat chassis also sports an end washroom with a large walk-in shower equipped with “shower tower” of shelves and fittings including a shower head on a riser bar with a trigger mechanism for water flow control. We liked that for being eco-friendly. The toilet is the latest electric flush Thetford version with larger seat and 18 litre wheeled holding tank. The semi-sunk basin has a cupboard below and across the corner of the washroom is a big triangular shaped wardrobe with a hanging rail and five shelves, two of which are removable giving flexible use of space. Do we agree with the judges? Well yes, but the judges made a few salient comments about the class as a whole which include; “lost marks through lack of a towel rail and lack of shelving” (particularly noted in more expensive models). “Solid doors” were praised. A number of washrooms were recorded as “well” or “very well” thought out and the marks given were markedly higher than in recent years, indicating steady improvement. The “glass bowl” sinks were not to everyone’s taste though some thought they were striking in appearance. There were concerns about what would happen if one broke or got chipped as they look vulnerable to such things happening. In all, we thought these were two great motorhomes with fantastic washrooms.